Photo taken 11/21/09 looking south on Champlain Street, NW. Before photo courtesy of Flickr user M.V. Jantzen. 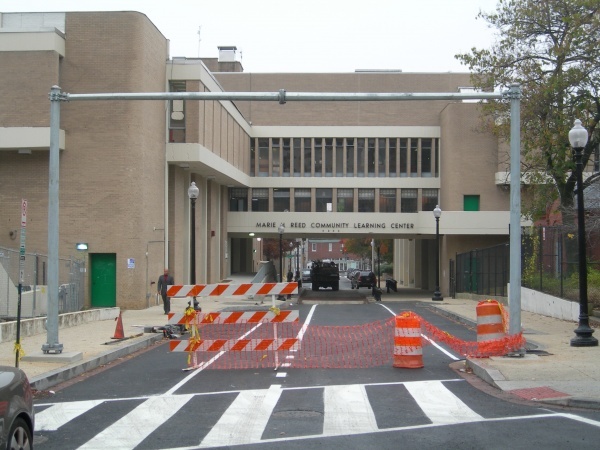 The much anticipated reopening of Champlain Street under Marie Reed Reed Community Center in Adams Morgan is complete. The project features a northbound contraflow bike lane on the newly created one-way southbound stretch of Champlain. It also includes a large speed hump/crosswalk to facilitate safe ground floor crossing for pedestrians between the Center’s two massive sections. The bizarre metal structure pictured above seems to be designed to avoid trucks that exceed the clearance of the underpass from slamming into the building. Additionally, sharrows were painted on the southbound lane. These improvements now make Champlain an excellent north-south biking alternative to the busy Adams Morgan retail corridor on parallel 18th Street. This project is an excellent example of Crime Prevention through Environmental Design (CPTED). 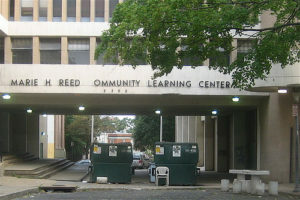 Built in 1973, the Marie Reed Center created a deadening effect on its surrounding neighborhood. The area became a launching point for criminal activity in the busy Adams Morgan nightlife scene and the site of several high profile shootings and robberies. This project not only rationalizes the confusing street grid in this area, but vastly increases the number of eyes on the street on the southern end of Champlain. More pedestrians will feel comfortable walking along the road because of better lighting and consistent car circulation. More pedestrians and drivers will, in CPTED language, enhance the perceived risk of detection and apprehension for criminals; creating benefits for the entire neighborhood.